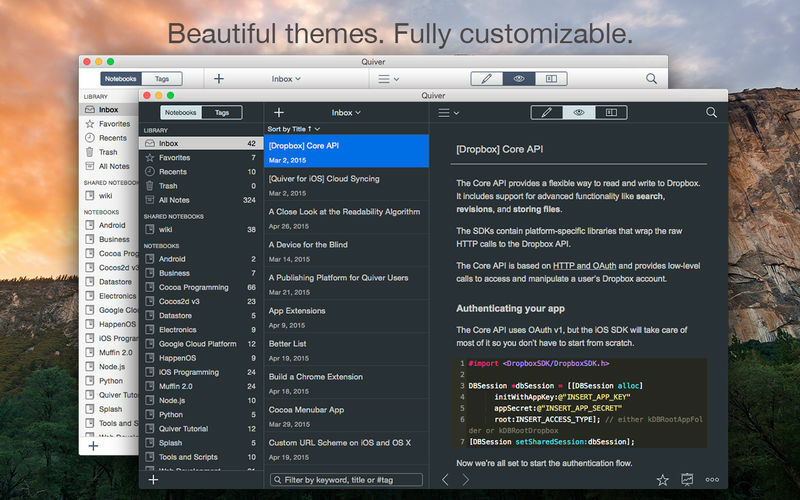 Mix Text With Code - A note in Quiver is comprised of cells --- snippets of text or code. You can freely mix text cells with code cells, even setting different language modes for different code cells, all inside one note. Edit In Place - Whether you are writing code or changing text styles, edits are always made in-place. There is no mode switching in Quiver. You just click where you want to edit and start typing. 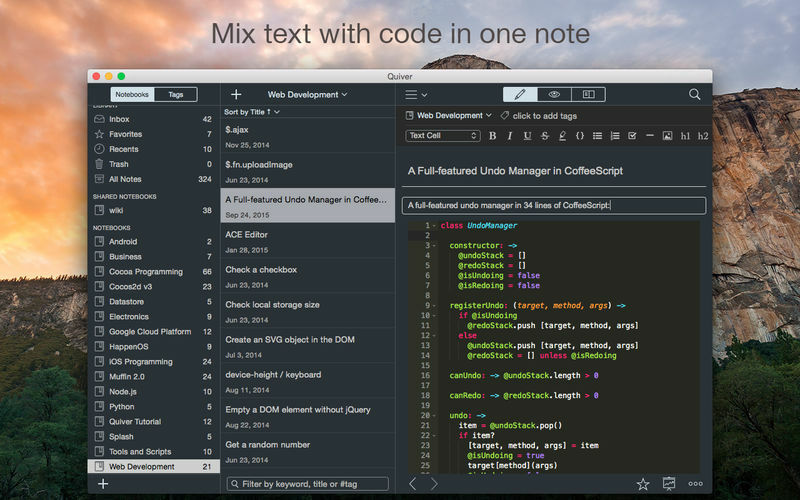 An Awesome Code Editor - The programmer's notebook should make code editing effortless. 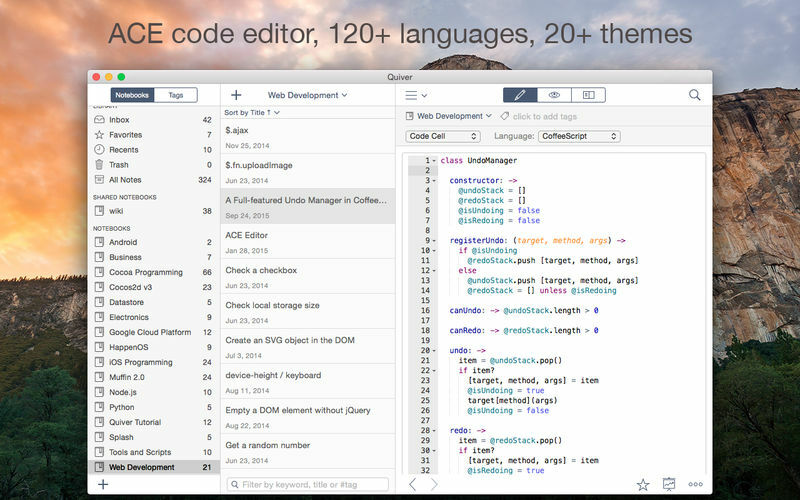 Quiver packs the awesome ACE code editor in code cells, which supports syntax highlighting for most languages, over 20 themes, automatic indent and outdent, and much more. Lightning-Fast Full-Text Search - Notes are only useful if you can find them quickly. Quiver's full-text search is based on Search Kit, the same technology used to power Spotlight on your mac. That's how Quiver can search through thousands of notes in a blink of an eye. Tags - If organizing notes into notebooks isn't enough for you, Quiver also lets you assign tags to each note, so you can manage your notes any way you like. Autosave - Quiver automatically saves all your changes as you work, so you never need to worry about losing changes. Plain JSON - Quiver saves your notes in the plain JSON format, so you have full control over your content. You can export a note in the JSON or HTML format, or print it to PDF. Added web clipper support. “Quiver Web Clipper” is available for download from the Chrome Web Store.